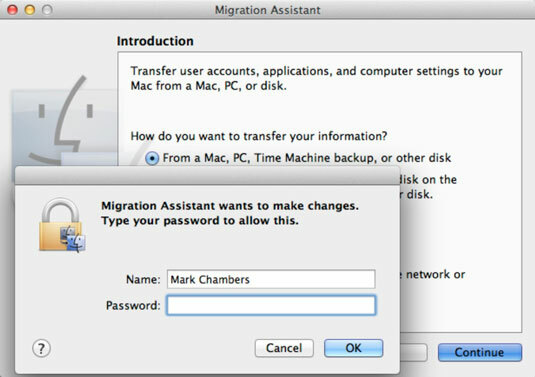 If you’re upgrading from an older Mac running OS X to your new MacBook or MacBook Pro, and need to import your old files, here’s great news for you: Apple includes Migration Assistant, an application that allows you copy data from your old Mac to your new machine, via your laptop’s Ethernet network connection, a FireWire or Thunderbolt cable, or an existing Time Machine backup on an external hard drive. If you’re a MacBook Pro Retina or MacBook Air owner, you might be scratching your head looking for a FireWire port on your new laptop. You don’t have one. Therefore, you can use only a Thunderbolt connection. However, you can use a wired or wireless Ethernet network connection between computers. You can even transfer over your network a limited amount of data from Windows to your new MacBook! Setup launches Migration Assistant automatically if you indicate that you want to transfer stuff during the setup process, but you can always launch Migration Assistant manually at any time. Simply open Launchpad, click the Utilities folder, and then click the Migration Assistant icon. User accounts: If you set up multiple user accounts (so that more than one person can share the computer), the utility ports them all to your new Mac. Network settings: Boy, howdy, this is a real treat for those with manual network settings provided by an ISP or a network administrator! Migration Assistant can re-create the entire network environment of your old Mac on your new laptop. Documents: The files in your Documents folder(s) are copied to your new Mac. Applications: Migration Assistant tries its best to copy over third-party applications you’ve installed in your Applications folder on the older Mac. You might have to reinstall some applications, anyway. Some developers create applications that spread all sorts of files across your hard drive, and Migration Assistant just can’t keep track of those nomadic files. Other applications transfer just fine, but you might have to reenter their serial numbers. If Migration Assistant isn’t already open, open Launchpad and click the Utilities folder, then click the Migration Assistant icon. Click From a Mac, PC, Time Machine backup, or other disk. Migration Assistant prompts you for the account name and password that you create during the setup procedure. Your account is an admin account, meaning that you have a higher security level that allows you to change things in Mountain Lion. Type your account name and password, and then click OK. Characters in your password are displayed as bullet characters for security. After you successfully enter your admin account name and password, this dialog disappears, and you get to play in the real Migration Assistant dialog. Select the From a Mac or PC radio button and then click Continue. Launch Migration Assistant on the other computer. Your MacBook searches for available computers using your wired or wireless Ethernet network. MacBook Air owners, as well as owners of the current generation of MacBook Pro Retina laptops, will have to use either a wireless network connection or a Thunderbolt-to-Gigabit-Ethernet adapter (for a wired Ethernet network). If you’re migrating data from a PC, you must download and install the Windows Migration Assistant. Select the computer with the data from the list, and then click Continue. Select the check boxes next to the user accounts that you want to transfer from your older machine. Migration Assistant displays how much space is required to hold the selected accounts on your new laptop’s hard drive. Select the check boxes next to the applications and files that you want to copy. Select the check boxes next to the settings that you want to transfer. Normally, you want to migrate all settings groups. Migration Assistant may take an hour (over a wired connection) or even several hours (over a wireless connection) to complete, depending on the amount of data to be moved.